Security Labels are used secure hardware and assets identity from getting altered, theft, unpacked and malicious modifications. Security labels are used for the prevention of theft and leak of essential data or assets. With increasing retail channels and rising need for goods protection in large super markets, the requirement for security labels has gained appreciation over the time. The demand for security labels have been ever increasing in beverage and cosmetics industry and with the venture of more canned and tinned foods making way into the market, security labels market is anticipated to showcase a high growth rate over the forecast period. Security is used for the prevention of products being counterfeited or tampered after manufacturing in the market. This aids the company in the protection of its brand image in the market and prevention of misrepresentation of the brand. 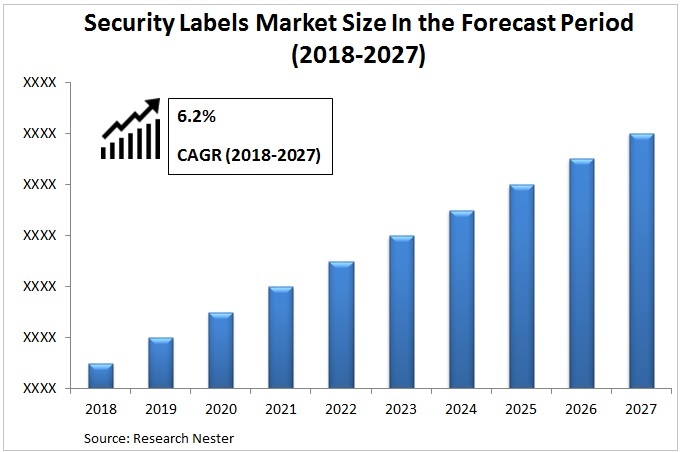 Security labels market is anticipated to record a CAGR of 6.2% over the forecast period. Security labels market is expected to reach the value of USD 19 billion at the end of the forecast period. Many multi-national companies are concentrating towards new product advances in security labels. Moreover, the many advantageous properties of security labels are exploited in the field of various end-user industries recently. Increase in consumption of packeted consumer durables which is expected to drive the security labels market rapidly. Currently the global security labels market is observing a vibrant growth owing to increasing demand of cost effective product securing methods in the market. Advances in various end-user industries in the past few years and growing product counterfeiting concerns across various manufacturing sectors are projected to drive security labels market besides the wide range of functions of security labels in an immense range of products such as canned food, beverages, cosmetics, medicines, deodorants, electronic devices and more during the forecast period i.e. (2018-2027). The rising demand for security labels for various reasons in pharmaceutical, electronics, retail industries are expected to drive the market rapidly over the forecast period. Rapid industrialization and increasing economic development with thriving manufacturing sector is expected to boost the security labels market in the developing regions across the globe. Increasing cases of product theft and counterfeiting is leading to more manufacturers opting security labels for product protection and brand misrepresentation which is expected to contribute significantly in the growth of the security labels market. Rise in disposable income in the present population is increasing the adoption of packaged food and beverages which are expected to increase the pressure on security labels market from the food and beverage industry during the forecast period. Growing urbanization is resulting in increasing retail channels across the developing regions around the world that is anticipated to drive the security labels market sturdily. Moreover, growing demand in the electronic industry for highly advanced gadgets and brands within regular intervals of time is anticipated to cause a rise in demand for security labels in the electronics market over the forecast period. Furthermore, the increasing usage of security labels by growing automotive and construction industries is estimated to impact the security labels market appreciably. However, increasing trend leading to rise in demand for customized cosmetics and personal care products made DIY style before the customer itself is expected to slow down the security labels market growth leisurely over the forecast period.